That went poorly. I won't belabor the point, because the Braves played like garbage in a lot of ways in this series. 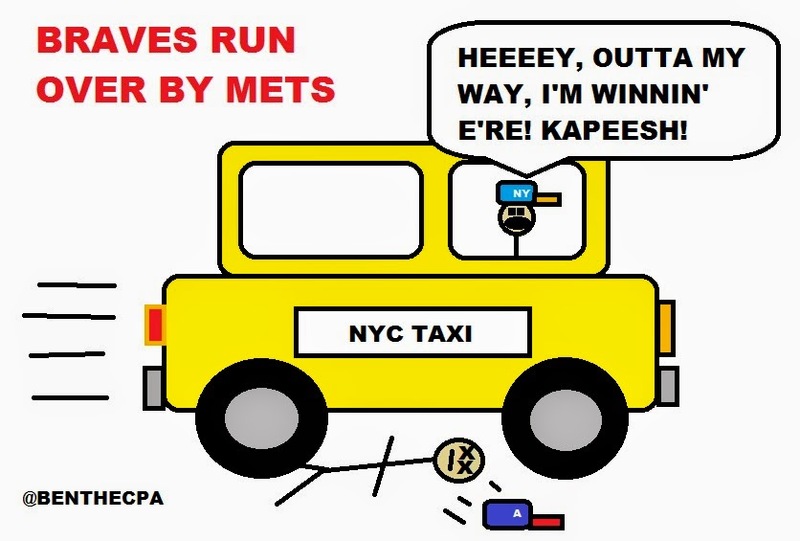 But really, the Mets took advantage of some bad bullpen outings by Atlanta. Still, I think our team is going to walk away from this series feeling like they let some games get away. I believe the Braves were squaring up pitches and hitting balls right at guys. If it wasn't for the poor pitching, the Braves would have won the series. Breaking down the games individually would be fruitless since they were all losses, so I'll go with the quick and dirty version. Braves got annihilated in game one because they couldn't score and gave up a ton of runs, they gave away game two because the bullpen couldn't hold a lead, and they got roughed up late in game three because apparently our guys decided to walk the ballpark. The bullpen - 7 runs in approximately 10 innings. That's what the bullpen gave up in this series. For those of you who like to attach an ERA to it, that's about a 6.30 bullpen ERA over the last 3 games. That won't even get the job done in the California Penal League. We wear caps and sleeves at this level, son! RISP Hitting - Braves went 3-17 with runners in scoring position, and that's a robust .176 batting average. Somewhere in California, BJ Upton is nodding his head saying, "Yeah that sounds about right." Gonna party like it's 2014. Did I say party? I meant weep silently in my room with Lionel Ritchie on Pandora. The defense - What went so very well for so long suddenly became a clown car rolling up to the New York Subway. Atlanta committed 3 errors in the series, and I should remind you that they had only committed one all season before this. If they were planning on tripling anything, I would have preferred...triples maybe? That would have been neat. Since we lost all the games we have no MVP. Instead I'll point out the NBI. That's the Needs Big Improvement. That player is second base. Now, I know what you're thinking, second base is an inanimate object, or a position, not a player. And you'd be right. However, second base for the Braves has basically been non-functional for several years. I actually had to ask Twitter when the last functional everyday second baseman played for this team. They came up with Marcus Giles in 2006. Some tossed out Infante and Prado, but I consider them utility guys who play a lot of 3rd. And I make the rules, so I decide the winner. The guys attempting to play second base right now are Jace Peterson, Phil Gosselin, and Alberto Callaspo. Mostly Peterson though since he won the job in spring training. Still, I looked up the hitting stats of the person who happened to be playing second base this season. Combined across all games, second base has a .170/.241/.208 slash line. That's horrific. Dan Uggla in 2013 hit better than that, and we paid him to go away and punish our rivals. The really shocking thing is that Callaspo hits while playing other positions. When he's at second, he has a .182 average. When he's at 3B? He's got a .320 average. Yeah. Second base for the Braves once got a chain letter and threw it in the trash in 2006, and this is the result. A decade of crap at second based. Maybe when the new stadium opens we can bathe second base in a four-leaf clover pesto. Because good lord, it's like watching a horror film out there right now. Next up, the Braves head to Philadelphia to face a team that's 5-11. Several of the Phillies players wear Life Alert jewelry so somebody can come get them if a slide goes wrong. Should the Braves beat this bunch of millionaire aging clap-trap? You bet they should.